Do you hear that sound? That buzzing? 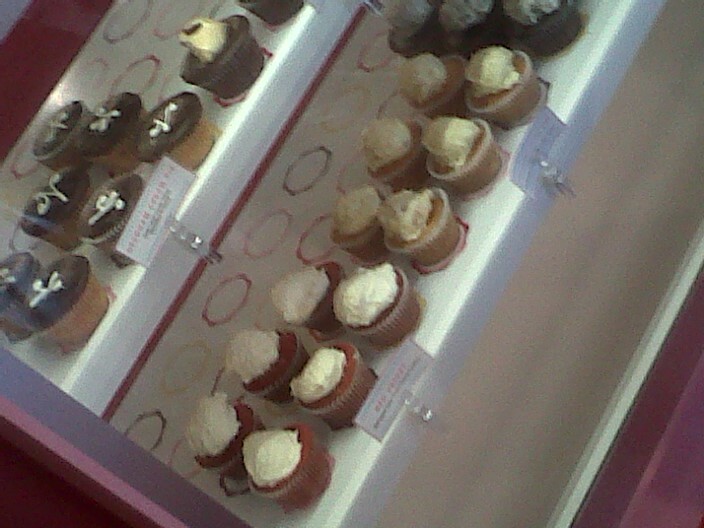 Oh that's right- a new cupcake shop opened in Needham, and Massachusetts is all "a buzz" about it! It is really no surprise though as Treat Cupcake Bar is taking an all new approach to the single serving treats and making them more fun and interactive than ever before! I don't know about you, but when I was a kid I remember loving when it was time to bring in birthday cupcakes to school. I remember my mom and I sitting around the kitchen, and baking what seemed like dozens of cupcakes together, and then icing them as best we could. I distinctly recall my mother's cakes looking 100 times better than mine ever did :-). But that was the fun wasn't it? Slathering on a gooey mess of sugary icing, choosing how much or how little you wanted, deciding whether you wanted the icing to reach the edges...or not. Treat Cupcake Bar brings back all that nostalgia, and delivers a delicious cupcake to boot! I was first introduced to Treat some months back when the Chowhound boards started talking about a new cupcake spot coming to Needham. I was immediately excited as I felt for a while that though the cupcake craze has taken off, Needham was lacking. Finally, after much anticipation, the new store opened and John, lovely as he is, picked up a box of their assorted cupcakes for me try out one day. I knew immediately after sampling just one mini cupcake that I wanted to feature this company- they were just that tasty. However, what won me over even more, was the ideology behind the spot. Just like the memories I'm sure most of us have of decorating cupcakes in our childhood kitchen, Treat owner David LaLiberte, wanted to capitalize on that memory, and offers a "Make Your Own" style bar, where the pro's mix in any number of fun toppings into the icing flavor of your choice, and then allow you to spread it on your own cupcake. Imagination at work right there! Think Pop Rocks and Gummy Worms to cure that nostalgic vibe! Beyond the fact that this concept is just extremely fun-it also really highlights the dedication that Treat has to creating a fun and welcoming atmosphere. The initial concept of Treat was a place for families to spend time and have fun together- a concept that I personally feel is lost too often. 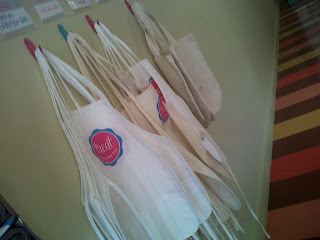 When I visited Treat, I can attest that this initiative was a live and well. Groups of families with parents and children of all ages littered the store, smiles abounding and the only blackberry use I spied was my own as I attempted to photograph the scene. Even walking into the store on my own that afternoon, hearing the laughter and giddiness (ok sugar high) of the kids there, made me leave with a big smile on my own face as well. Of course it's not just the joy of the fun of Treat that makes it a great spot. 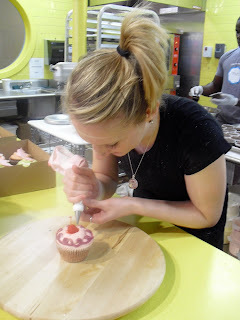 In fact, if you don't feel like getting your hands dirty by slathering on your own icing, Treat has incredible options of cupcakes already iced and decorated, and pretty enough to take a picture of. Even better-they taste delicious too. The box that John brought home for us had a great combination of both chocolate and vanilla cake in it, and each was decorated with either vanilla or chocolate icing, some with fun toppings, and some without. The cake itself was really tasty- just the right texture of crumbly cake without too much or too little moisture and a really pure flavor. The icing was fantastic. It reminded me completely of the great homemade icing my mom used to make- sugary with that great real butter flavor to it. Nothing about this cupcake was fake, and the dedication to real ingredients is apparent. Treat Cupcake Bar is really going above and beyond in not only promoting a spot where a family can come together and experience the best kind of good clean fun, but they are also lending their own hand to help charities in the area, and in turn really helping us all. Treat Cupcake Bar is not far from downtown Boston, in the heart of the great town of Needham. I urge you all to check it out for delicious cupcakes with down home frosting and a great way to help out local charities to boot. I love the "make your own" idea! So much fun! Also love how some of the money goes to charity. Very nice touch. Great article!